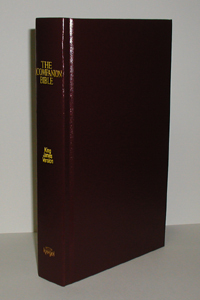 The Companion Bible is a new Edition of the 1611 KJV English Bible. Published originally in six Parts it is now presented in one Volume and is a self-explanatory Bible designed for the general use of all English readers throughout the world. It is called The Companion Bible because its wide margin is intended to be a Companion to the text; and the whole is designed as the Companion of all readers of the Bible. A classic one-volume study Bible in the King James Version. Helps include: 198 appendices including explanations of Hebrew words and their use, charts, parallel passages, maps, lists of proper names, calendars, and timelines. Burgundy hardcover with 10 point font size. A classic one-volume study Bible in the King James Version. Helps include: 198 appendices including explanations of Hebrew words and their use, charts, parallel passages, maps, lists of proper names, calendars, and timelines. Burgundy hardcover with 8 point font size.